If you do not have a detailed evaluation plan, completing a realistic budget may be difficult. However, going through the budget planning process will help you and your team to think through real-life implementation of your evaluation. At the outset, we advise you to consult with the budget and human resources offices within your organization to verify and understand your particular budget process, rules, and stipulations. Please keep in mind that frequent and clear communication with the program evaluation designers is essential to creating an accurate and meaningful budget. In the section on selecting a team, you may have considered the different types of staff that you would like to involve. You may have selected staff from varying levels of your organization and from different types of outside agencies. It is important to know what impact these selections will have on the budget. While this may seem tedious or difficult to track, understand the actual cost of staff time helps you to better understand how your budget money is allocated and may provide insight on future allocations. It can be hard to predict the changing needs and costs for even the most well-developed program evaluation. One way to think about the costs for your materials and supplies is to estimate per event or activity. Because you are developing a budget for a project that has a relatively set start and end point, it may be possible to develop your expenditure amount using the event or activity method. Although it is possible to use existing office materials and supplies, it is advisable to draw from a separate budget for evaluation materials and supplies. Having to delineate an office supply order by either evaluation or regular office expenses can become tedious and challenging, especially if your budget technician is managing multiple accounts. Equipment costs typically include items that need to be purchased for the program evaluation, but can potentially be used for other projects at a later date. These items might include computers, computer software, tape recorders, and transcribing equipment. Keep in mind that it is important to check in with your budget personnel about their policies regarding expenditure categories. In many cases, including grant applications, it is expected that your equipment costs be listed separately from your material and supplies expenses. The equipment category may be a place where you can use existing resources and save on costs, depending on the budget policies at your organization. One basic way to think about developing an evaluation budget is to consider some fundamental questions of who, what, when, how, and where your evaluation will take place. As noted under Select an Evaluator, your program evaluator could be a consulting firm, educational researchers from a university setting, or members of your internal program team. There are challenges and opportunities for each choice. If using an educational consultant, review the budget carefully. What services are included and what services are not? Which services may cost additional time and/or resources? How are these possible additional expenses calculated and/or accommodated? If using educational researchers, the same questions apply. A few additional considerations also pop up. Most colleges and universities require researchers to include indirect costs as part of research costs. 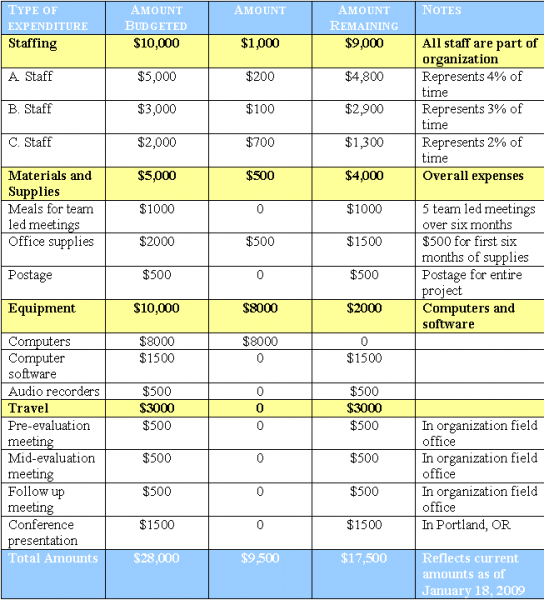 Will your organization be expected to pay some of these indirect costs? If you choose to assemble a program evaluation team from your own staff, you should consider the costs of time. How much time will staff be spending on this task in relation to time on other tasks? What additional types of training might be required to prepare your staff to design, conduct, and analyze the evaluation? Regardless of the staffing option you choose, it is essential to plan for costs related to personnel. A conversation with your human resources, payroll, and/or purchasing manager should also help you in determining what options are financially available to you. You may have limits to the types of people that you can hire, the length of time that they can be paid to staff or non-staff positions, and ways in which you can arrange for payments within your organization. For example, there may be a rule about hiring graduate students to work for more than 20 hours per week or you may not be able to employ a consultant for more than six months per year. Most, if not all, of these costs will appear in the staffing cost category. What will the evaluation include and how will it be conducted? Think about the decisions that you made in “Create a Strategy” as you thought through your evaluation. Once you have determined the necessary resources, you will be able to develop a comprehensive idea of the kind of materials and supplies that you will need to conduct your evaluation. If you are sharing resources with another department of your college preparation program, be sure to clearly delineate what costs will be shared and how resources will be allocated. Though it may seem easier to just note some items as shared resources, it will be difficult to know the actual cost of your evaluation if you do not make these notations now. When and where will the evaluation take place? How long will your evaluation take place? Will it spread out over one or more fiscal years? If so, what expenses will be incurred through these time periods? What is the overall pacing of your expenditures? Which months, weeks, or other time periods will require the most funding support? How is this reflected in your budget plan? Where will the evaluation take place? Will you need to reserve rooms or other spaces to conduct your research? If so, what related rental or clean up costs will you need to include? Are there start up costs related to your budget plan that are not reflected in your evaluation plan? For example, you may hold planning meetings; incur printing costs and mailing costs as part of the pre-evaluation process. How will you account for those costs? Conversations with your program evaluation designers are key in responding to these questions. They serve as a starting point for thinking about the unique features of your evaluation design and program expectations. Below is a sample budget spreadsheet used to conduct a nine-month study of a college preparation program serving 11th and 12th graders in their transition from high school to college. The main categories of the study and general types of activities that took place are noted within the notes section of the spreadsheet.